Spring on the urban homestead is so beautiful and bountiful that I can hardly believe it, and I spend more time than I care to admit just wandering around dazed with the wonder and joy of it all. But there is a practical aspect to my trance, because while giving thanks to the cosmos for the life that surrounds me, I am noting what can go in the salad bowl that evening. 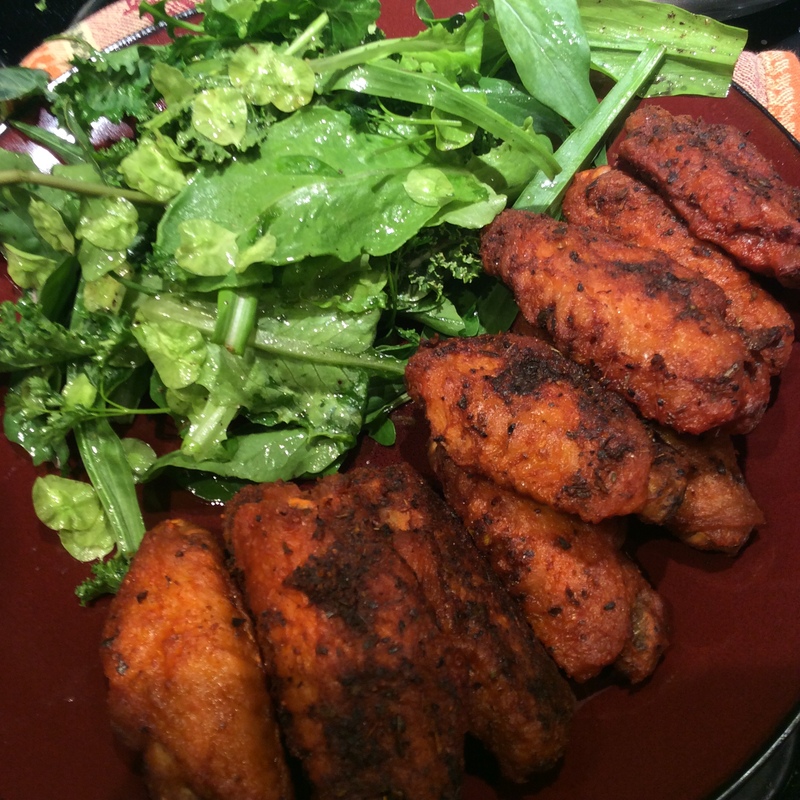 The salad shown above is a pretty typical urban homestead salad. It contains a handful of lettuce, some early arugula, and a lot of biennials and perennials that wintered over and got an early start. Tiny leaves of curly kale that began to leaf out as soon as the weather got warm are good salad material, still sweet from night frosts, although I don’t like older kale in salads. There is a little chervil because I threw the seeds around in warm spots last fall. 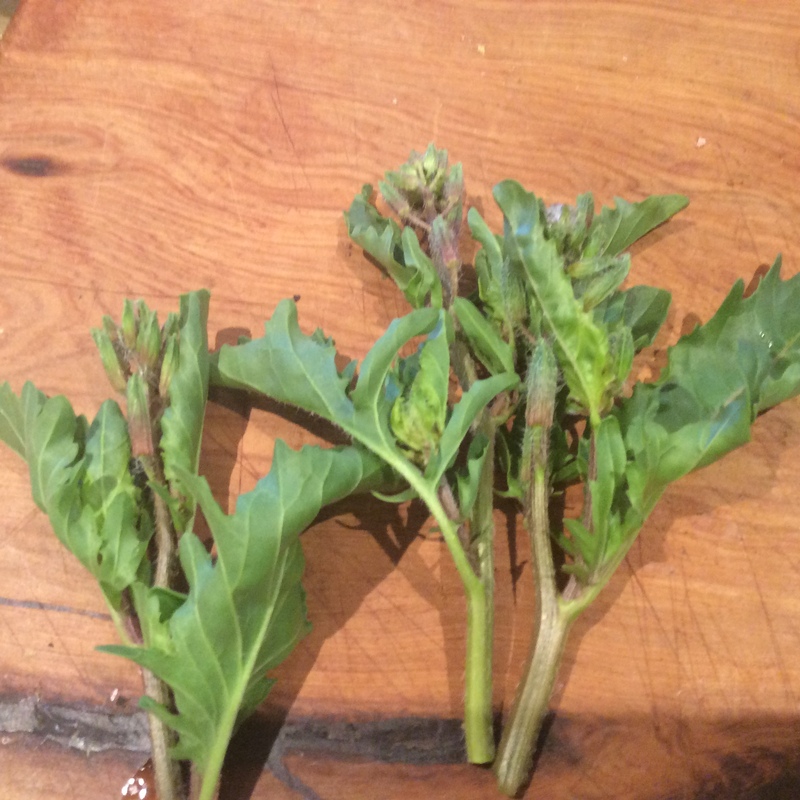 A few further notes on the ingredients: in the past I had tried cooking scorzonera greens and thought they were fairly uninteresting, but for some reason I never tried them as salad material until this year. 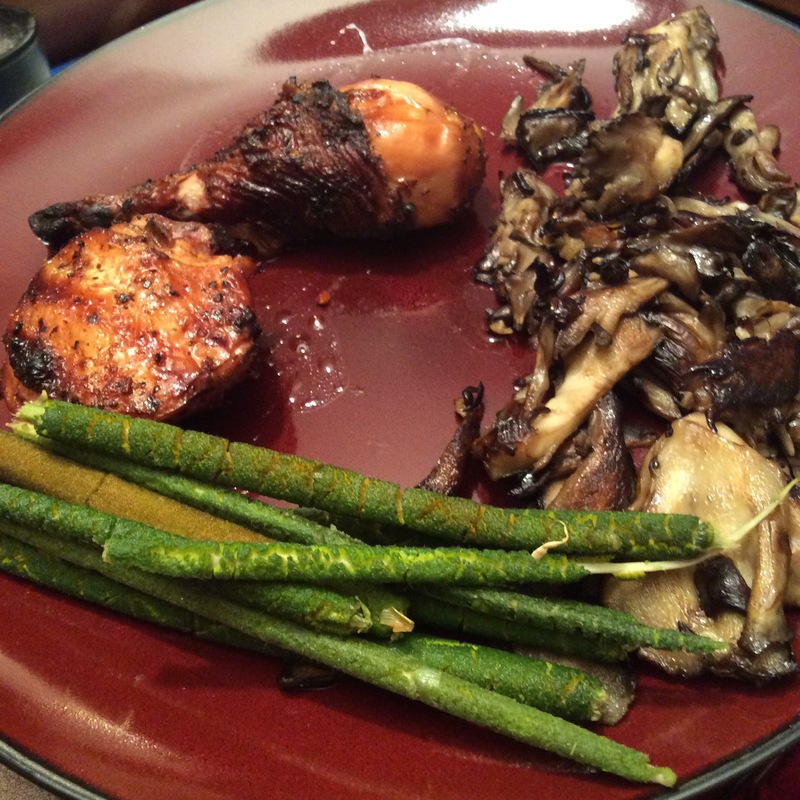 They are very mild in flavor and have a nice slightly substantial and tender texture, and I am using them a lot now. 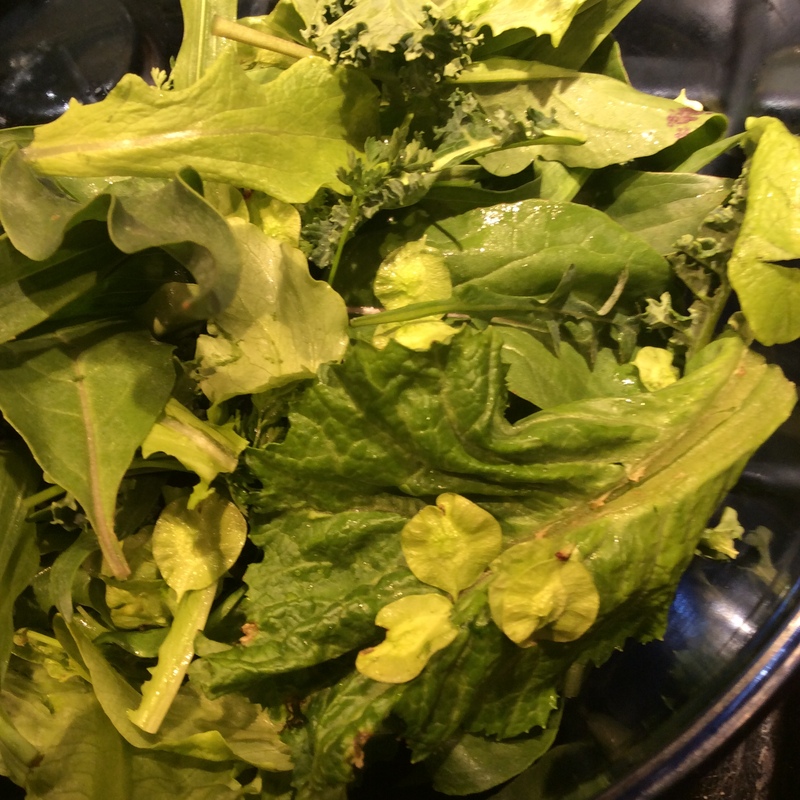 They make a good base for some more flavorful greens like dandelion and mustard and arugula. I have written in the past about how much I love the elongating flower stalks when pan grilled in olive oil, so this is a very good dual purpose vegetable. I plan to plant more of it. In the past I have mostly used Siberian elm samaras as a “hand salad” eaten spontaneously on walks when they presented themselves. 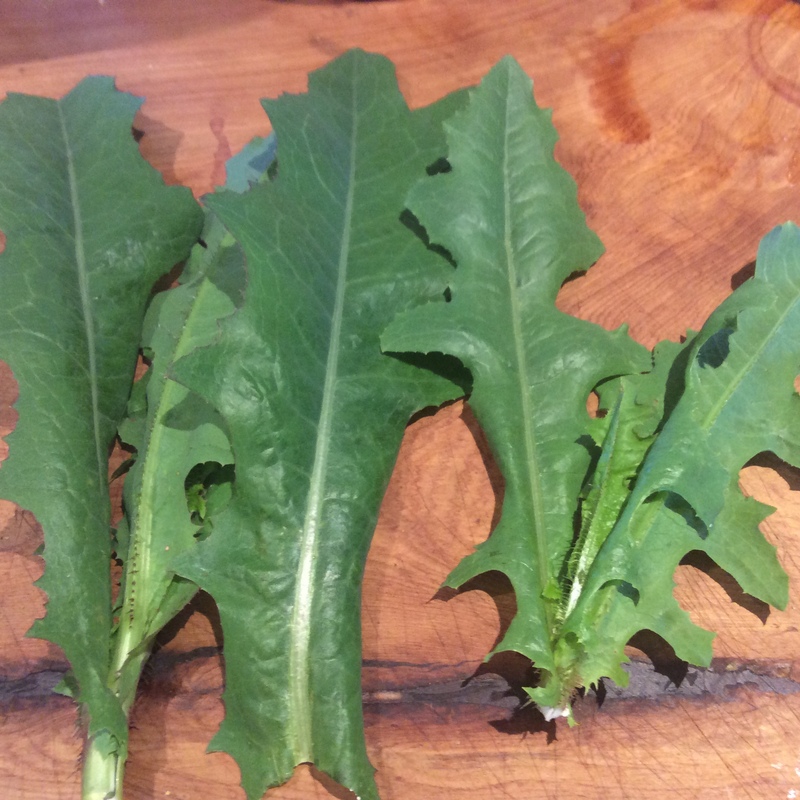 They are too mild to be of much interest cooked, although I do use them in greens mixtures sometimes, but I have found that I like them in salads in rather substantial amounts, probably a cup of washed samaras in a salad for two. There is something about the texture that I enjoy, provided you pick them at the right stage, when they are about the size of a dime and the edges are still fresh green and have not yet grown at all papery. They need a little bit of cleaning, but most of the debris can be floated off once you have broken up the clumps with your fingers, and 15 minutes of preparation is not too much for a vegetable that cost you no effort or money whatsoever in the growing. Have a look at what’s available to you in field and forest and in your own yard. Learn how to make a really good vinaigrette. Use common sense, and don’t eat plants unless you are completely sure that they are edible. Recently I read a cookbook which I am not going to name because I was quite disappointed in it but can’t stand to pan such clearly goodhearted efforts. So I will only say that it is from my favorite publisher and has the word “permaculture” in the title. The recipes are perfectly good vegetable based recipes, similar to those in many, many other good cookbooks on the market. My disappointment is this: it concentrates on the usual annual vegetables that everybody grows, with occasional vague mentions of foraged greens or wild mushrooms, and seems to me to have very little to do with permaculture. So, uh, why call it that? So today I’m going to indulge myself and make a plea to all potential authors, and talk about what a real permaculture cookbook would offer, with great hope that somebody knows of one or will sit down and write one. I am a semi-permaculturist at best, and even so some very strange produce indeed comes through my kitchen. Some examples: nettles, bladder campion, hops shoots, green garlic, blackberry shoots, cattails, unripe as well as ripe apples and plums, Goumi berries, clove currants, wax currants, linden leaves, mulberry leaves and unripe fruit as well as ripe berries, rau ram, ginger and turmeric leaves, radish pods, chicory leaves and roots, burdock stalks, milkweed, daylilies, hosta shoots, groundnuts (Apios americana, not peanuts,) goji shoots and berries, canna leaves and bulbs, quinces, salsify, and scorzonera as well as the more usual veggies and fruits. 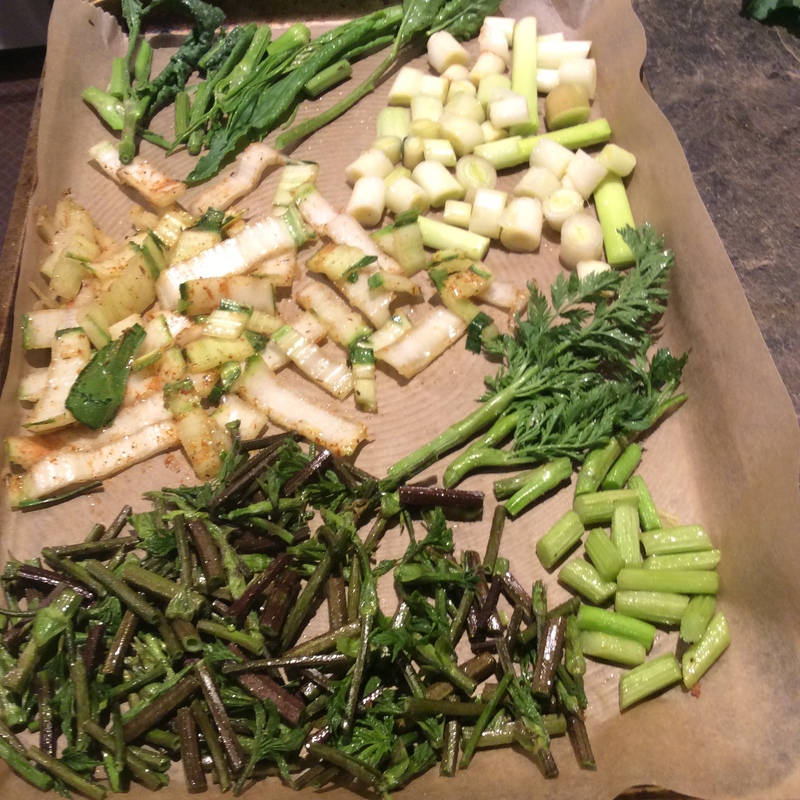 Bamboo shoots and the Japanese perennial vegetables Fuki and Udo should be ready to harvest in the next year or two. All these things grow well in semiwild tangles that can be managed with little or no soil disturbance after the initial planting. I would love to read a cookbook about foods like this. I would love to read knowledgable descriptions of their flavor and texture profiles and how they change through the season, how other cultures have used them, and how to make them respected at the modern table. That, to me, would be a real permaculture cookbook. I know that all over the world there are committed permaculturists working with these plants and eating them. I do hope that somebody will put it all in print. I’m hoping for a cookbook as weird and thoroughly wonderful as Baudar’s The New Wildcrafted Cuisine but devoted to the daily surprises, wild and cultivated and in-between, that can be offered by a single piece of land. While I wait for this book to be brought to my attention, or written, I hope that you will comment with something unusual that you’ve eaten recently and what you thought of it. 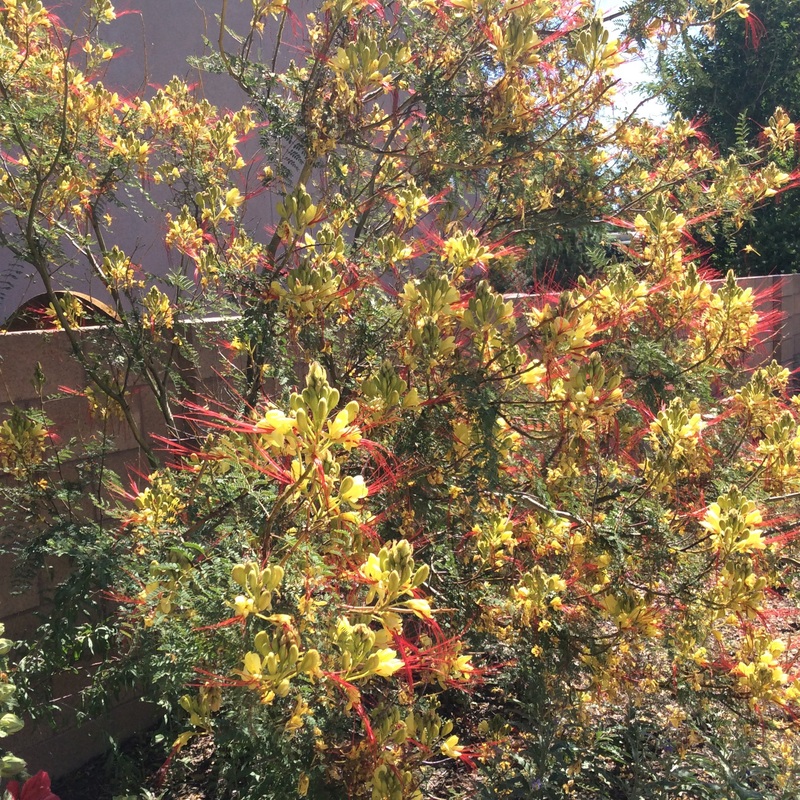 Caesalpinia gilliesii, the Desert Bird-of-Paradise, is a spectacular plant. It is native to South America but is naturalized throughout the Southwest. It would probably grow in other places. 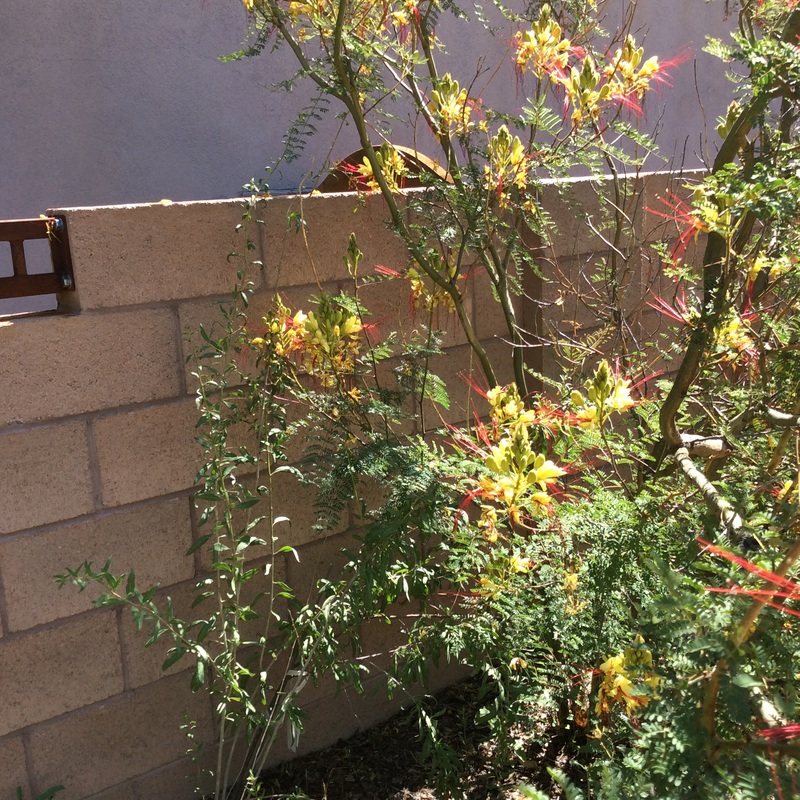 It thrives on our alkaline soil, baking desert sun, and low rainfall. It’s gorgeous in bloom and neat-looking when not in bloom. It seeds itself around but is easily eradicated where not wanted. It provides filtered shade to other plants. And it fixes nitrogen. Quite a set of advantages. I’m making use of it on a dry, hot, unirrigated strip of south-facing land along my driveway where I want to grow goji berries. The goji plants struggled and mostly died at first, but as seed-sown bird-of-paradise takes hold and provides them with some shade and nitrogen, the gojis are getting a new lease on life and have finally put out some berries. I trudge the hose over and give everything a deep soaking about once every 3-4 weeks. For years I struggled with Caragena arborescans, which is the darling of the permaculturists but simply will not grow well, or at all, for me. Now I have Caesalpinia instead. No part of it is edible but it helps edibles grow. It has survived 10 degrees Fahrenheit with no problems. In Britian they do have hardiness issues with it, and I think it won’t tolerate wet feet. For dry gardens it works beautifully. So look around you and see what nitrogen-fixers thrive in your area and grow without pampering. Use them. Don’t fuss with the ones that are determined to die. Near my home there is a mulberry tree that has delicious black fruit and low-hanging branches. When the fruit ripens, I throw my ketogenic diet temporarily out the window and go every evening to stand under it, gorging myself, while my dogs eat dropped fruit off the path. This is one of the greatest joys of the summer season. But it isn’t by any means the only use for mulberry trees. On my own property I don’t have any mulberries big enough to fruit, but I do have two mulberries that I harvest greens from. 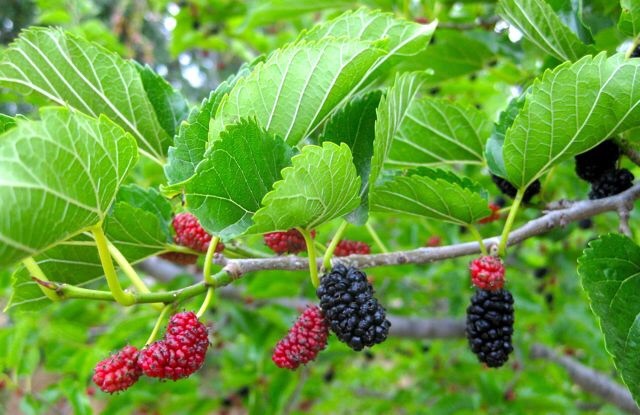 The leaves of all mulberries are edible when young and tender, but flavor ranges from tasty to nasty. By hanging around a local organic nursery and surreptitiously tasting leaves, I got a couple that had fairly good-tasting leaves. At my last home I had a mulberry with delicious and large leaves, but alas, that tree is no longer mine, and I didn’t try rooting cuttings because I had no clue how hard it would be to replace. But the ones I now have are passable. The trees will rapidly grow tall if you let them, which I don’t. From the time they are 4 feet high I start managing them for leaf harvest by keeping them small. At first this is a matter of a little delicate trimming and weighting some branches so that they grow out nearly parallel to the ground. Later on in their lives, much harder cutting is needed, and by the time that they are 5-7 years old, they need coppicing (cutting off a few feet above the ground) to keep them in check. 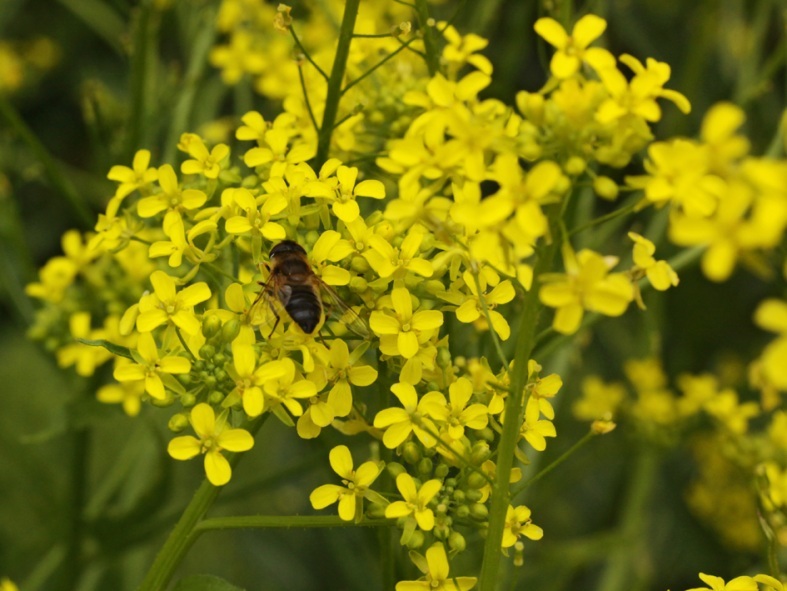 Coppicing keeps them from producing fruit, and incidentally they also don’t bloom and produce their incredibly allergenic pollen when managed this way. 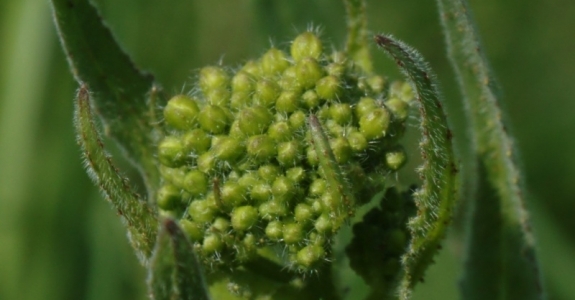 They do produce masses of young tender tips that can be pinched off at the point where they are nonwoody and break easily and cooked as a green, a good green that fills in gaps between cold-weather and hot-weather greens and contains resveratrol as a bonus. At the point when my coppiced trees start producing more greens than I can use (which is a few years down the road,) I will start harvesting bigger branches for my goat, who thinks that mulberry branches are the food of queens. Mulberry leaves can also be dried to make tea, although I think the resulting tea is pretty insipid stuff and needs other herbs for interest. I would also use “extra” cuttings for mulch and spare biomass. 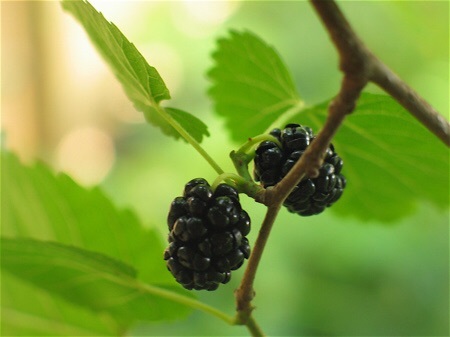 For more about mulberry trees, see the link below for a terrific and very comprehensive post about mulberries in permaculture. Don’t miss the wonderful pictures of stuffed mulberry leaves! The recipes are available too, and I plan to try this soon. 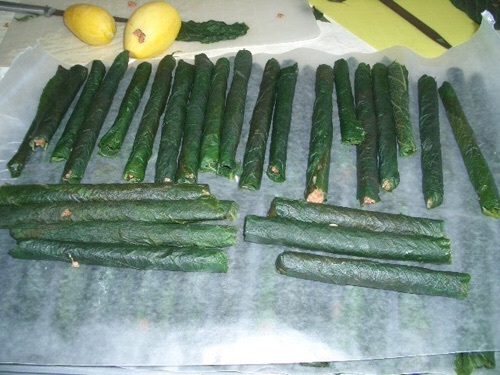 This image of stuffed mulberry leaves, poached from the Temperate Zone Permaculture post linked in above, looks especially interesting to me. Check out the recipes in that post. 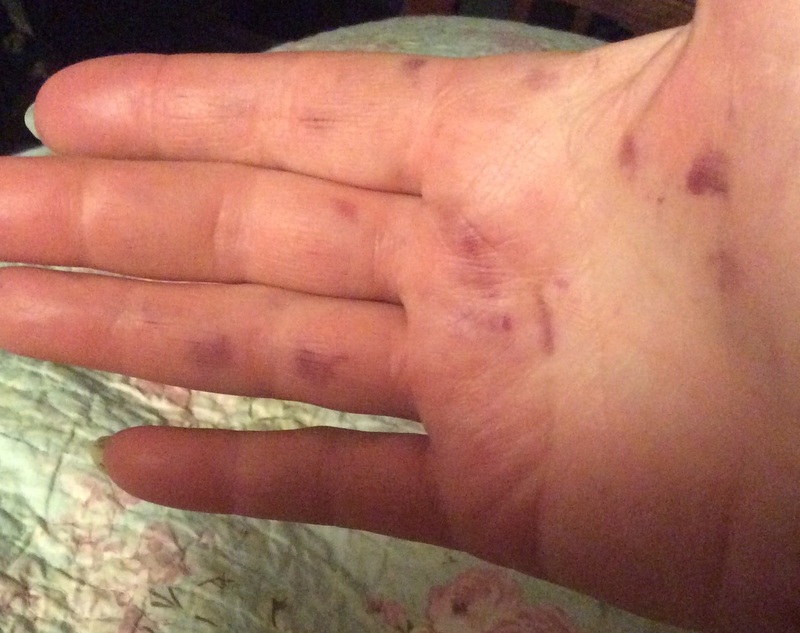 The stigmata of the mulberry fancier. Consider yourself warned. 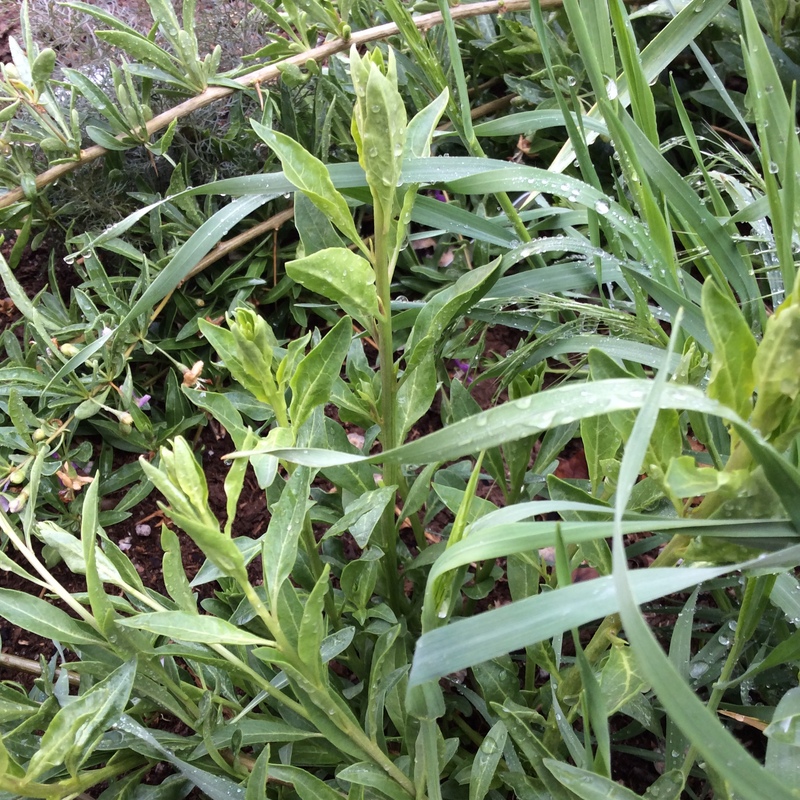 I’ve written a lot at various times about the Holy Trinity of edible weeds: lambs-quarters, amaranth, and purslane. In this post I don’t plan to say anything much about harvesting and cooking lambs-quarters, Chenopodium album, since I’ve said that already and the short version is “harvest them young, collect as little stem as possible, and use them like any other mild-flavored leafy green.” Personally I dislike the texture and mouthfeel of the raw leaves intensely, and only like them cooked, but others see it differently. This is their great season; after midsummer they are very eager to make seeds and are no longer very usable as a leafy green. The focus today is on how to have them in your garden without losing everything else. They are highly competitive. First, don’t just let a nice big plant go to seed in your garden, unless you have a lot more space than I do, because they get six feet tall and nearly the same across and tend to flop around, and nothing else in that bed will survive. 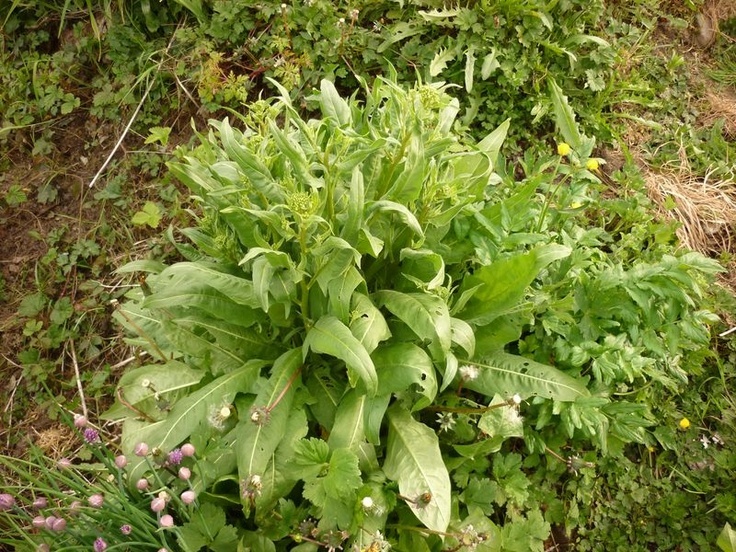 Instead, look over your self-sown lambs-quarters (which you almost surely have,) choose one right at an edge or corner of a garden bed, cut it down to an inch from the ground, and keep hacking at it until late summer, allowing it to make exactly one branch which lies out horizontally over the ground of the bed. This branch is allowed to go to seed, and everything else is clipped off. It helps if the planned plants in that bed are large and robust. All other lambs-quarters in that bed are pulled out by the roots after harvesting. 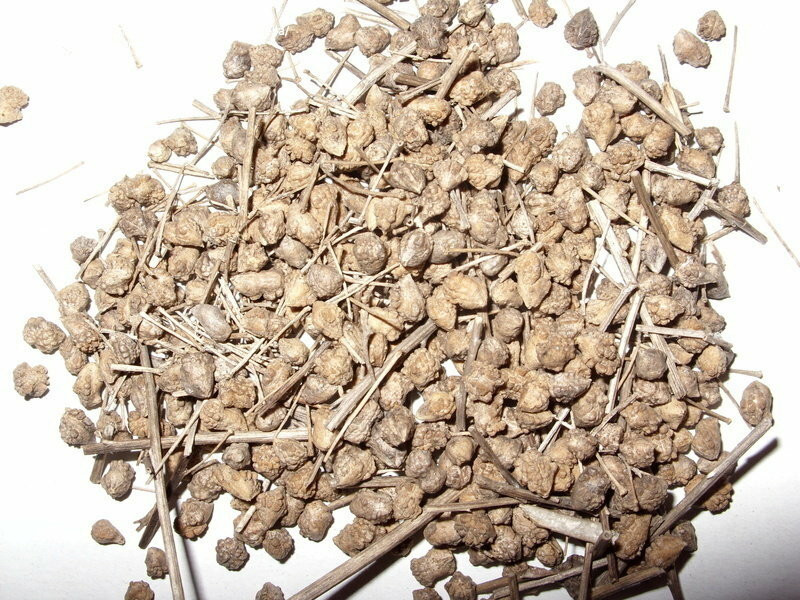 Your mother plant will dry out in early fall, very unattractively I might add, and when you are sure that it’s dropped its seed, you can dig the husk of the mother plant out. This will take a lot of effort and a good shovel. Next spring, you will see a fine mist of seedlings on that bed. Keep them watered for tenderness, harvest them at 6-8 inches tall, and be sure to pull out the roots. If you are growing other things in that bed, be sure to give everything else a head start. In the bed shown above, I hoed up the ground when the seedlings showed and planted collards and onions. Don’t worry about hoeing the seedlings. There are millions more to come. Then I let the second wave of lambs-quarters seedlings grow up among my plantings. Today I’ll harvest the lambs-quarters, and mulch around the remaining veggies and let them take over. 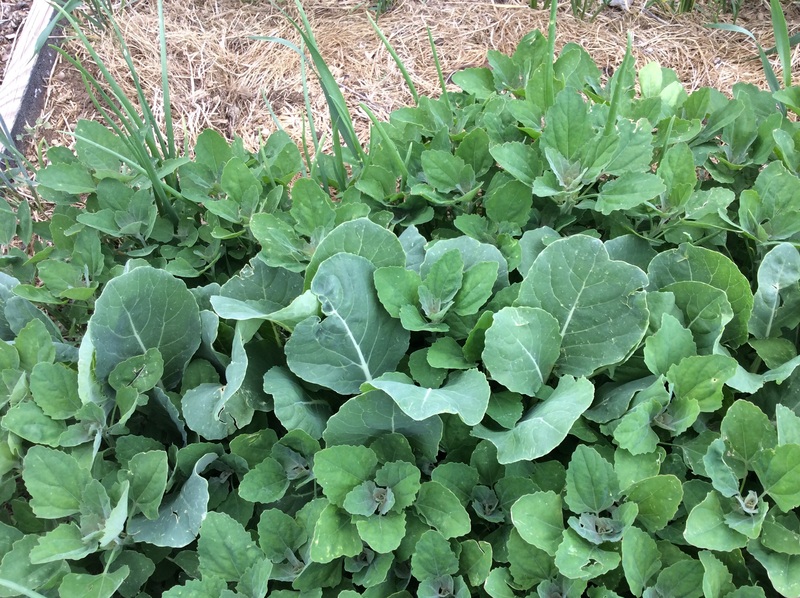 No doubt this decreases the total yield of collards and onions, but if you use a rich mulch like stable bedding they will make up for the slower start, and overall you are getting remarkable yields for the space. 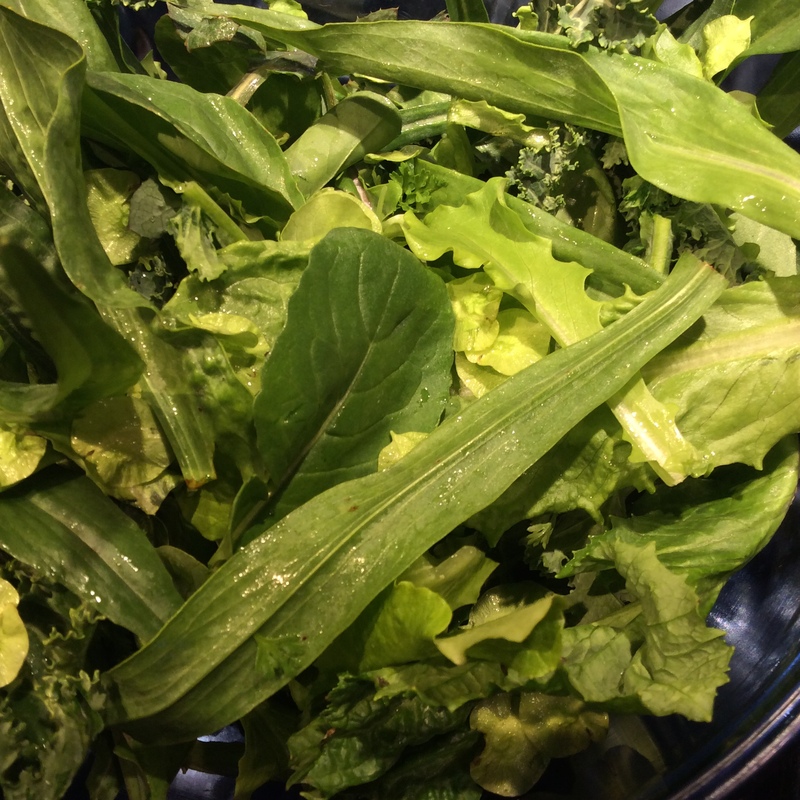 The returns are especially remarkable if you consider nutrient density, since lambs-quarters are among the most nutritious greens that you can eat. You should only have to do this once, or maybe once every several years. You will then have millions of potential lambs-quarters in your soil and can grow a crop of them at any point in late spring or early summer that you have a bit of empty space. Just water the ground and stand back. 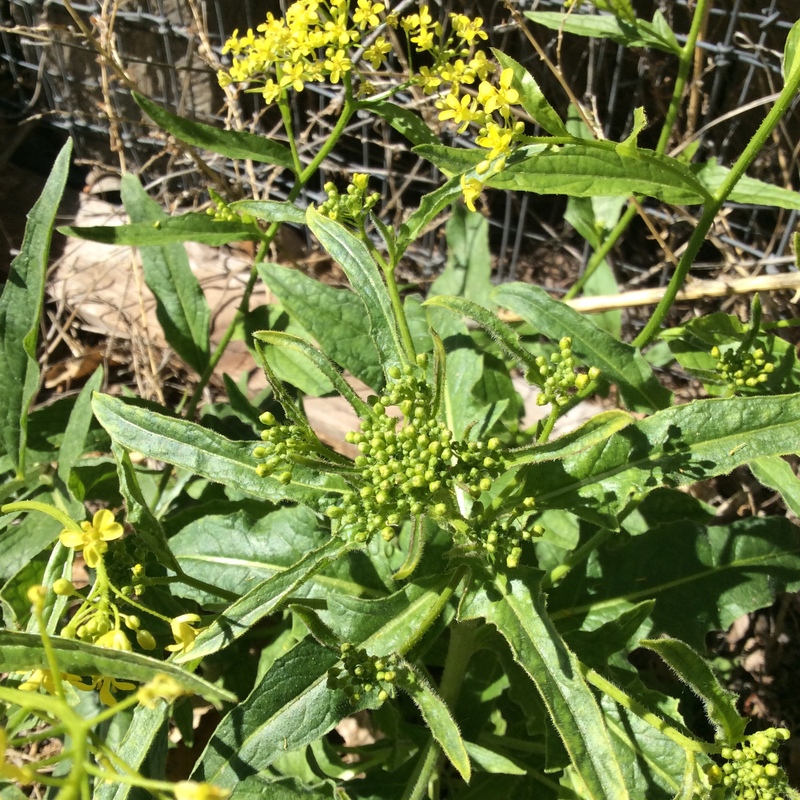 The marvelous foraging guide by Dr. John Kallas called “Edible Wild Plants: Wild Foods from Dirt to Plate” will enable you to identify and cook your bounty.